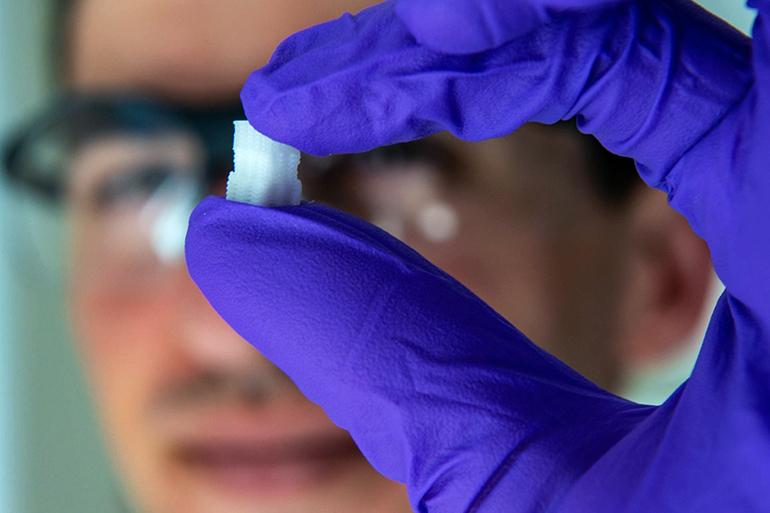 Bioscientists are moving closer to 3D-printed tissues to help heal bone and cartilage damaged in sports injuries to knees, ankles, and elbows. The key is mimicking tissue that turns gradually from cartilage (chondral tissue) at the surface to bone (osteo) underneath. The researchers printed a scaffold with custom mixtures of a polymer for the former and a ceramic for the latter with imbedded pores that would allow the patient’s own cells and blood vessels to infiltrate the implant, eventually allowing it to become part of the natural bone and cartilage. Additional coauthors are from Rice, the University of Maryland, and Wake Forest School of Medicine. The National Institutes of Health and the RegenMed Development Organization supported the research.